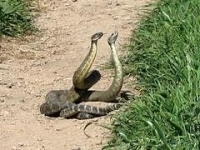 Now, rattlers are immune to their own venom so there's no way they were going to fight, I figured. So I was surprised when one moved to dispatch its rival the same way it would its prey . . . It bent down, grabbed the other by its tail and began to swallow. Of course, the only defense the other had was to grab its aggressor by tail and try to swallow faster. Well they gulped and swallowed until they reached all the way up to the base of each-other's head. A second or two passed, and as though a command was given, they both gave a final gulp . . . and there was nothin' left of either one of 'em. And that's the truth!